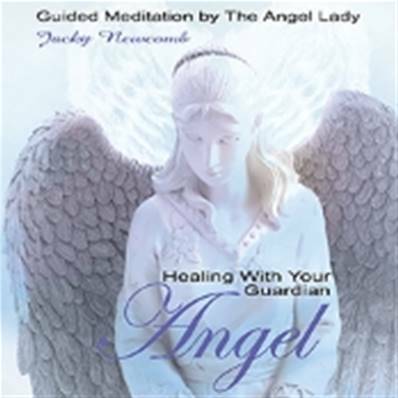 HEALING WITH YOUR GUARDIAN ANGEL by Jacky Newcomb. "Have you ever wondered if it might be possible to work on healing with the assistance of your guardian angels? Our spiritual guides and celestial guardians are closer than you might think, and they are always willing to assist with our healing problems. By following this guided meditation CD I have prepared for you, you will find your journey to heal with your angel a little easier. I use this meditation in my workshops and many people have powerful experiences when following along." Jacky Newcomb. Jacky Newcomb is an angel teacher and runs workshops all over the UK. She has written for many of the UK’s leading holistic and paranormal magazines (including Vision, and Fate and Fortune, and runs a column (‘Dear Angel Lady’) for CHAT ITS FATE magazine. You may want to play the longer version a few times to familiarise yourself with the meditation first of all and then later, when you have more confidence, the shorter version may be all that you need. If you are short of time, as we all are in our busy lives, it will make it easier to maintain your connection with your guardian angel by playing the short version several times a week – or more depending on your daily routine. Each time you play the guided meditation your results will become clearer and stronger. "Warm and uplifting, this this magical CD will put you in touch with your own guardian angel, and bring the peace of mind we all crave." Each CD contains 2 Guided Meditations. The second featured guided meditation is much shorter (approx: 10 mins) and cleverly enables an angel meditation to fit much more easily into a busy everyday life.